Mothers United Against Violence President Henrietta Beckman lost her son Randy 20 years ago to gun violence. "I have seen so many young people lose their lives in our nation," she said. Lucy Gellman Photos. 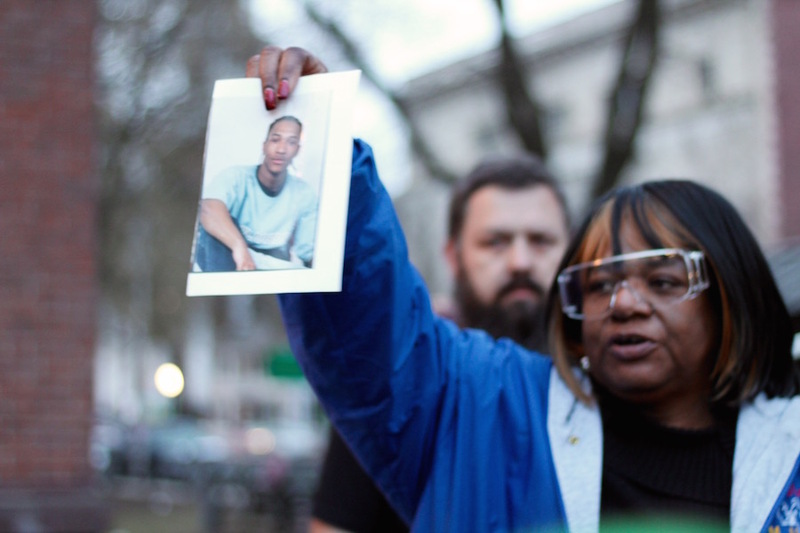 Henrietta Beckman beat the fiery barrel of a gun for her son Randy, who was shot in the head 17 years ago, and never lived to see his son grow up. David Weinreb beat it for his grandfather, the victim of a self-inflicted gunshot wound when Weinreb was only seven. Mayor Toni Harp beat it for not just all the funerals she’s attended in New Haven, but for the kindest third-grade classmate she had, who was killed while playing with a loaded hunting rifle. 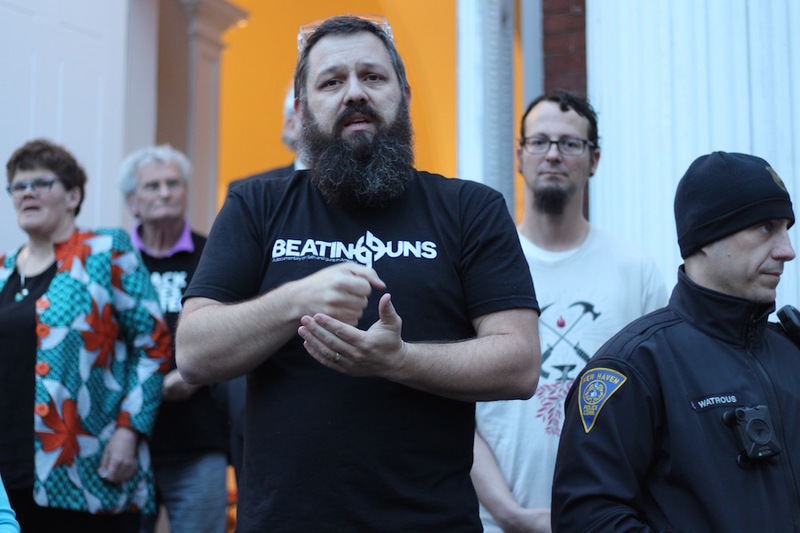 Sunday night, 50 advocates, activists, gardeners, faith leaders and politicians gathered at United Church on the Green for “Beating Guns,” a community presentation and interactive demonstration from activist Shane Claiborne and RAWTools Founder Mike Martin. 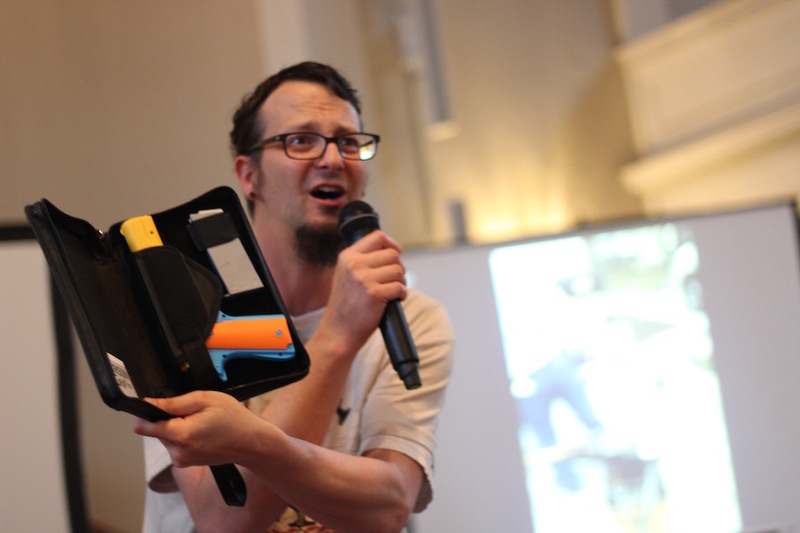 Over two hours, the two spoke about their work, invited the community to beat a repurposed gun into a garden tool, and presented community gardeners with weapons turned into mattocks, picks, trowels and forks. Top: Weinreb takes a turn. 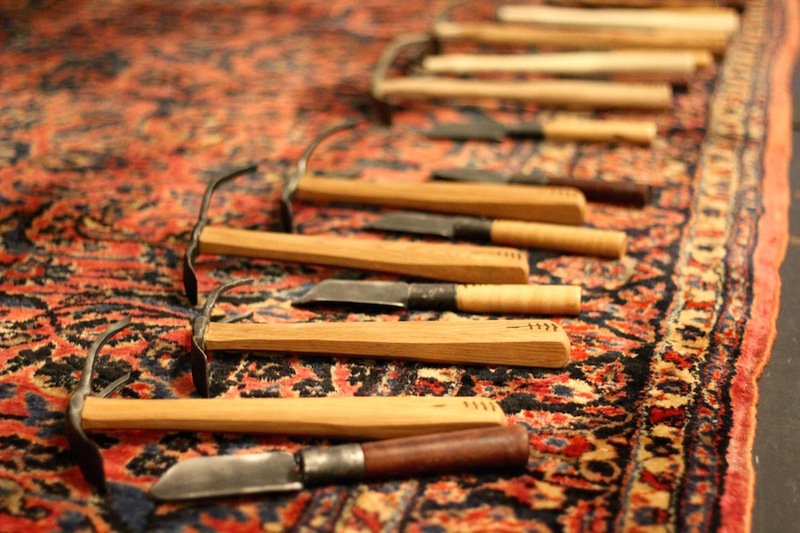 Bottom: Each finished tool has an olive branch at its base, which gardeners are meant to touch when they use the objects. Martin suggested that placing the olive branch on the tools completes their peace-oriented mission. Together, Claiborne and Martin are authors of Beating Guns: Hope For People Who Are Weary of Violence. In the book and on the tour, they argue for tangible alternatives to gun violence—like turning semiautomatic rifles into gardening hoes, musical instruments, and public art. New Haven marks the 28th stop on a 35-day Lenten tour that the two will finish the Friday before Easter. 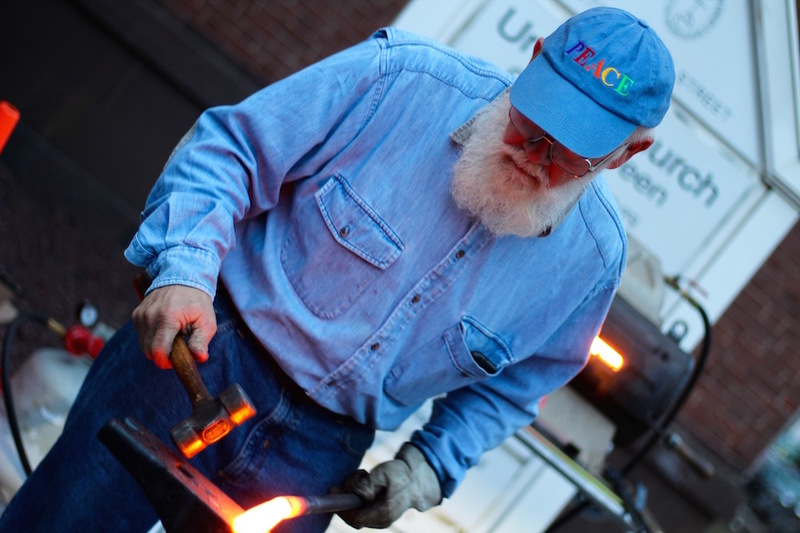 The event also marks a milestone for New Haven’s Swords Into Plowshares initiative, a collaboration among The Newtown Foundation, Yale New Haven Hospital, The New Haven Police Department, the Episcopal Church in Connecticut, The United Church on the Green, sculptor Gar Waterman, RAWTools and the New Haven Correctional Center that transforms guns into garden tools through blacksmithing. As he spoke, Martin praised the city for going forward with the project where other cities "saw red tape and stopped." 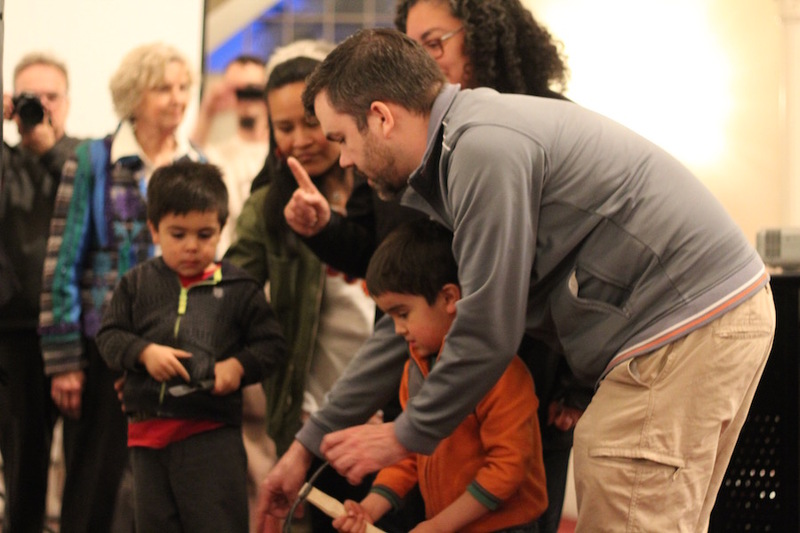 After beginning during the city’s sixth annual gun buyback program in December 2017, Swords Into Plowshares held a public presentation last September, in which inmates beat disassembled firearms into mattocks. According to Curry, the initiative has thus far used 141 guns from the buyback, all of which have been vetted. Sunday, Claiborne and Martin described the role gun violence has played in their own lives, which have stretched from Pennsylvania to Colorado and back. The founder and executive director of RAWTools, Martin said he was inspired to begin the program in 2012, after a shooting at Sandy Hook Elementary School claimed the lives of 20 children and six adults. His wife, a first grade teacher, had the same number of children in her class that day. He realized that a similar attack could happen anywhere. Since founding RAWTools, he's seen semiautomatic weapons transform into tools that are literally meant to restore the earth. Shane Claiborne: "We saw too many kids die in our neighborhood." People began holding church services outside: on street corners where shootings took place, and then outside the local gun store. During one such service on Good Friday, he said it felt “like the tears of those moms 2,000 years ago met the tears of our moms, and the pain of Jesus became the pain of the neighborhood.” Then Papito’s mother ran up to him. 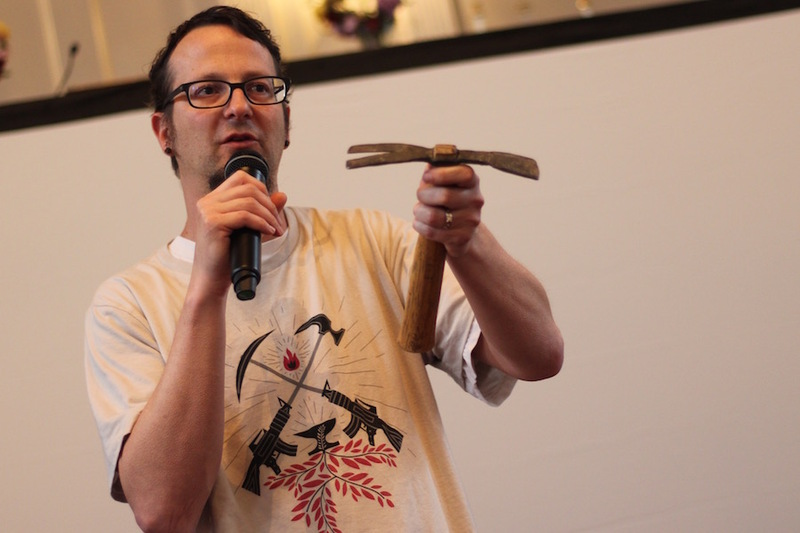 Claiborne told the crowd it marked a turning point for him, since which he has paired up with RAWTools, turned his activism into anti-gun “protestifying,” and been arrested for trying to present a garden tool to U.S. Sen. Pat Toomey. He praised Jacinda Ardern, prime minister of New Zealand, for taking decisive action within a week of the shootings in Christchurch in March. He rattled off statistics, asking attendees to add the words “Lord have mercy” after each data point. Claiborne showed attendees a zippered Bible case that is actually designed to hold a handgun. Each data point drew a handful of sharp breaths and murmurs of “Lord have mercy” from the pews. 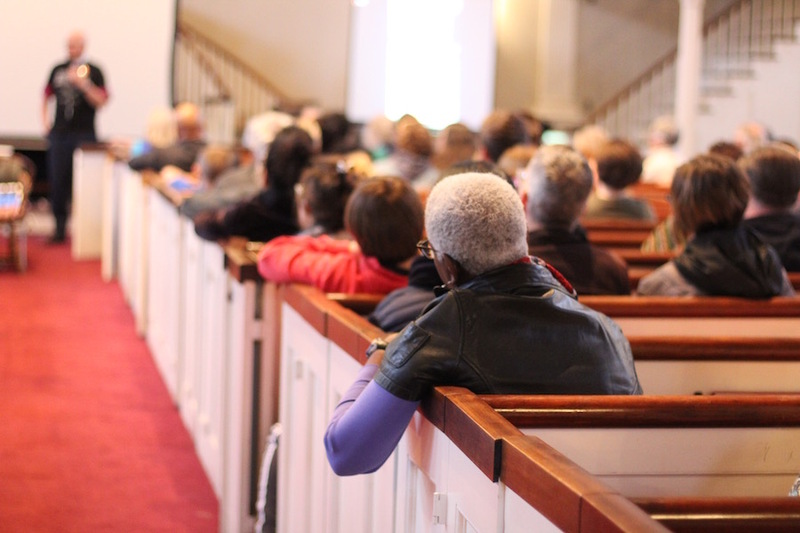 Claiborne grew more frustrated with each, pulled in as a pastor is to a sermon. He rolled through statistics: that the U.S. only comprises five percent of the world’s population, but almost half of its gun ownership. The country’s manufacturers are responsible for nine and a half million guns per year, which boils down to 18 guns a minute. That America loses 38,000 lives each year to gun violence. That’s about 105 per day. In that number, two-thirds of gun deaths are suicide. Ninety percent of those who attempt suicide with guns succeed—and more U.S. military die of suicide than in combat. Then he honed in on one that really gets to him: 41 percent of white Evangelical households have guns, preaching a gospel to which they do not fully ascribe. 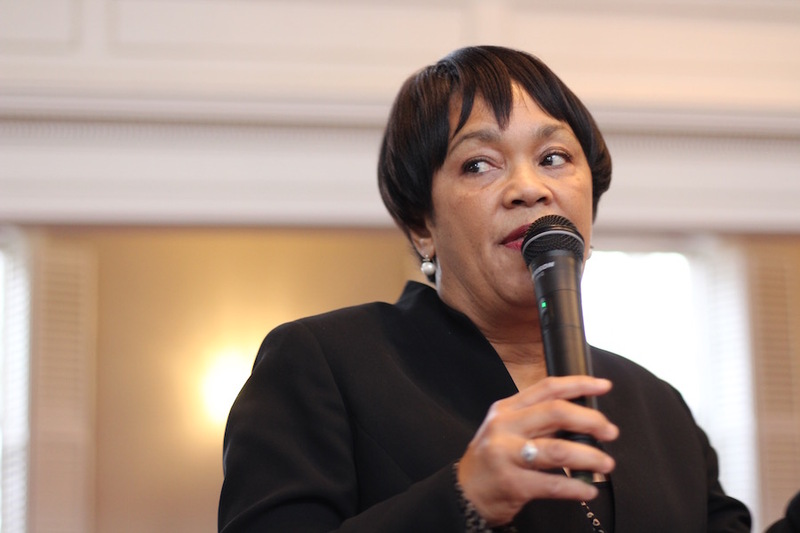 Those words echoed for Mayor Toni Harp, who recalled a third-grade classmate named Myron Hanson, who would ask her to dance each Friday, during school-required dance classes. The only Black kid in her grade—Harp was raised in Utah—she recalled that “no one else wanted to dance with me.” She came to know Hanson for his kindness. Then one Monday, Hanson didn’t come to school. Harp’s teacher struggled to explain what had happened. Over the weekend, it seemed that he had gone out to the country with his family, where his grandfather lived on a rural farm. Hanson and his cousin had found a hunting rifle in his grandfather’s house, and brought it out to the barn to play with it. Neither of them knew it was loaded when his cousin pulled the trigger. 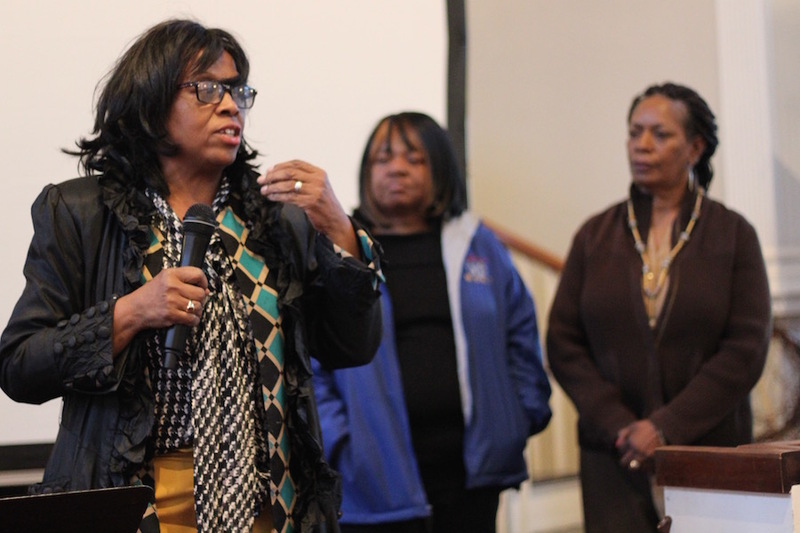 Harp recalled her early days as mayor in early 2014, as she attended a string of funerals of victims of gun violence, almost all of them under the age of 18. She said she has since told mayors in other cities about New Haven’s gun buyback program, encouraging them to take similar steps in the places they call home. In the hospital, Randy held on for four days. Beckman recalled that she was hopeful. And then on the fourth day, he took his last breath. Deborah Davis of Mothers United Against Violence. Behind her are fellow MUAV members Beckman and Freddie Graves. “I have seen so many young people lose lives in our nation,” she said. 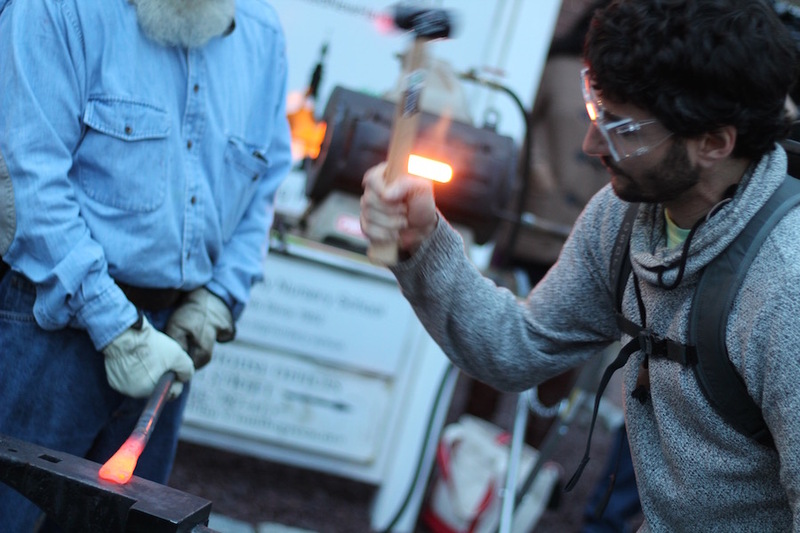 As song filled the church, attendees filed outside to watch—and partake in—a live forging with Fred Martin, a blacksmith who is also a RAWTools board member and Mike Martin’s dad. 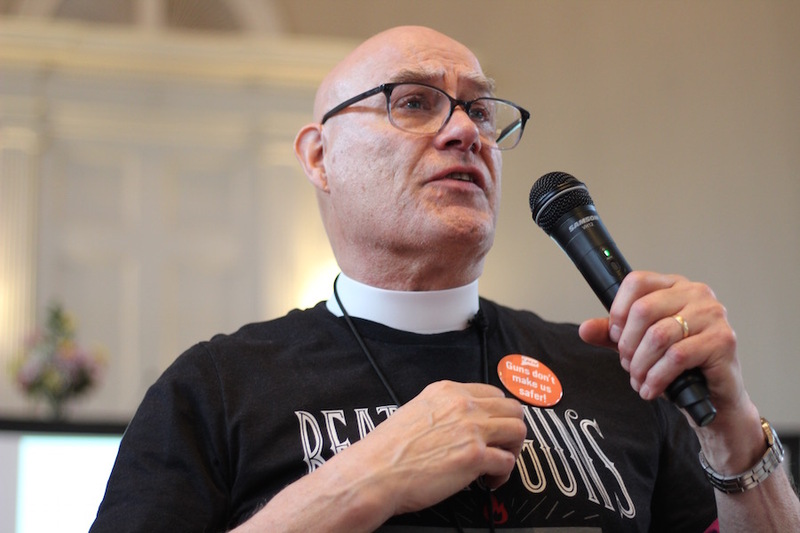 As Martin pilled out the red-hot barrel of a gun, Mike Martin explained that he thinks of the forge “like the fire of the Holy Spirit.” Then he invited attendees to help beat it into shape. Top: Fred Martin. Bottom: Mike Martin. Attendees formed a line around the operation, each donning protective eyewear before taking the hammer to the sword, and making it into a plowshare hit by hit. In the twilight, it took on a sacramental or reliquary quality, the barrel glowing red and then orange, sparks flying off with ever few blows of the hammer. Harp struck the barrel more than 10 times, methodical by the end. Weinreb introduced himself and mentioned his grandfather. Rev. Henry Brown, founder of Mothers United Against Violence, told the crowd “this is for New Haven, Hartford, Bridgeport.” Then he took the hammer carefully, and bore down on the barrel. 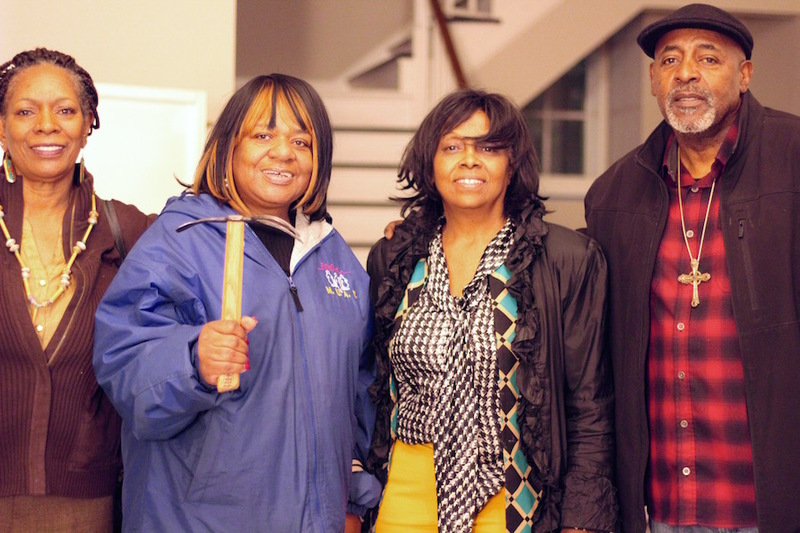 True to Claiborne’s promise that “tonight starts heavy, but it ends with hope,” the evening ended as community gardeners headed to the front of the church to collect new tools—forged from New Haven buyback guns—for their gardens. Representatives included Common Ground High School, the Clinton Avenue Community Garden, and several New Haven Land Trust Gardens. Picking a trowel from the bunch, Common Ground Farm Director Deborah Greig took a moment to remember 18-year-old Javier “Javi” Martinez, a Common Ground student who was killed in 2013 when someone shot him five times at close range. Foran (in the grey) with his boys, wife Enedelia and Catarineau. From the garden at the Amistad Catholic Worker House, Luz Catarineau called the event fitting, as she passes the one-year anniversary of her husband Mark’s imprisonment for breaking into Kings Bay Naval Base in Georgia. Joe Foran, who lives in the Hill with his wife and two young boys, recalled hearing semiautomatic gunfire one night while he was putting his son to sleep. The two both got on the floor instinctively. They later learned that two young men had been killed in the neighborhood. From left to right: Freddie Graves, Henrietta Beckman, Deborah Davis and Rev. Henry Brown. In an interview after the event, Beckman said she would be using her garden tool to show kids in Hartford that "this was a gun that killed" and is not being used for regenerative purposes. Gardeners also got the news that the initiative, just like the gun buyback program, won’t be ending in New Haven anytime soon. Thanks to Curry, there will now be two forges in the city, one that will live at the New Haven Police Academy and one that will be at Grace & St Peter's Episcopal Church in Hamden. He plans on taking the second, compact enough to fit in the back of his Toyota Highlander, around the state. “This has been for me the image of resurrection,” he added. To find out more about RAWTools or the Beating Guns tour, visit them online. To hear more of the music from Sunday night, click on or download the audio below.